Performers include: Kiefer Sutherland, Natascha McElhone, Adan Canto, Italia Ricci, LaMonica Garrett, Tanner Buchanan, Kal Penn, and Maggie Q. This political thriller series follows what happens when an unlikely person becomes the leader of the free world. Tom Kirkman (Kiefer Sutherland) is a lower-level Cabinet member, the United States Secretary of Housing and Urban Development. He’s the “designated survivor” to the current administration, an individual in the presidential line of succession who is at a distant and secure location when the President and the country’s other top leaders are gathered at a single location. On the night of the State of the Union address, an unprecedented attack claims the lives of the President and all other members of the Cabinet. Kirkman is immediately sworn in as President, unaware that the attack is just the beginning of what is to come. He struggles to keep the country and his own family from falling apart — while navigating the highly-volatile political arena and leading the search to find who is responsible for the attack. Seth Wright (Kal Penn) is Kirkman’s speechwriter and he has strong doubts about his boss’ abilities to lead the nation. FBI agent Hannah Wells (Maggie Q) investigates the attack and believes that there’s more to come from the perpetrators. She clashes with FBI Deputy Director Jason Atwood (Malik Yoba). White House Deputy Chief of Staff Aaron Shore (Adan Canto) advises the new President following the attack. A career military man, Admiral Chernow (Mykelti Williamson) is the Vice Chairman of the Joint Chiefs of Staff who becomes one of the new President’s most trusted advisors. Emily Rhodes (Italia Ricci) is Kirkman’s former Chief of Staff and a close friend of his family. Kirkman’s wife is EEOC attorney Alex Kirkman (Natascha McElhone) and their children are teenager Leo (Tanner Buchanan) and young daughter Penny (Mckenna Grace). Mike Ritter (LaMonica Garrett) is Kirkman’s Secret Service agent who’s charged with protecting the family following the attack. What do you think? Do you like the Designated Survivor TV show? Do you think it should be cancelled or renewed for another season? Designated Survivor: When Will the ABC TV Show Return? 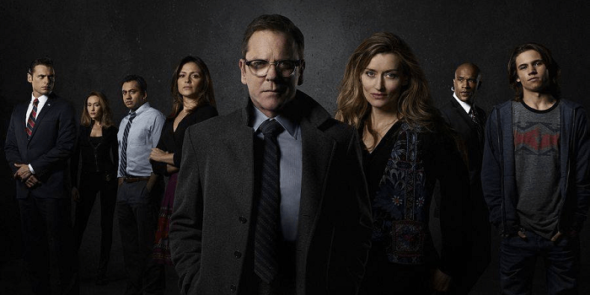 Designated Survivor: Season Two; Will You Keep Watching the ABC TV Show? I would like the show Designated Survivor is come back. I would like to see Designated Survivor come back on TV I really enjoyed the show. Keifer is great. Please bring Designated Survivor back! Love Designated Survivor! Definitely worth bringing back ! !